(CNN) -- Michelle Obama gave an impassioned speech before the International Olympics Committee. President Obama traveled overseas -- in the middle of debates over health care and Afghanistan -- to make his personal pitch to bring the 2016 Olympics to his hometown. 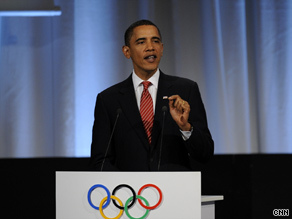 President Obama personally appealed to IOC members for the 2016 summer Olympic Games to be in Chicago. But despite their efforts, the Obamas will come home empty-handed as Chicago's dreams of hosting the Games evaporated in the first round. The news stunned those awaiting the announcement, many of whom thought the battle was between Chicago, Illinois, and Rio de Janeiro, Brazil. Rio also beat out Madrid, Spain, and Tokyo, Japan, to host the games. Although the White House says the trip was the right thing to do, some Republicans say it will have some consequences for the president. "Other than people who like to cheer, 'We're No. 4! We're No. 4!' I don't know how this is anything but really embarrassing," Republican strategist Rich Galen said, adding that Obama's failed pitch will probably be the joke on Capitol Hill for weeks to come. "Given the last two months starting with the August recess and all of the issues that surrounded that, I think that the White House staff, the senior staff needs to get together somewhere and figure out how they are going to fix this, because they are in a deep slump," he said. Upon returning to the White House on Friday, Obama expressed no regret about his trip, saying it is "always a worthwhile endeavor to promote and boost the United States." "One of the things that I think is most valuable about sports is that you can play a great game and still not win," the president said. "Although I wish that we had come back with better news from Copenhagen, I could not be prouder of my hometown of Chicago." White House senior adviser David Axelrod said that although the results were "disappointing," Obama did the best he could. "The president made, I think, a very strong appeal, and it didn't work out. But it was well worth the effort. Any time this president has a chance to go and promote the interests of this country and promote the interests of a city or a state within this country on something of this magnitude, he's going to take that opportunity," he said. Axelrod said Obama's appeal wasn't strong enough to overcome the "internal currents," pointing out that former IOC President Juan Antonio Samaranch was among those leading the bid to bring the games to Madrid. "I think there were other things that played there that we simply couldn't overcome, and that's life. Life goes on," he said. It wasn't a mistake for Obama to make the trip, Davis said. "I think the president did what we would expect him to do, and that is show leadership," he said. Obama spent just four hours in Copenhagen and flew back before the announcement was made. The president also met with his commander in Afghanistan, Gen. Stanley McChrystal, aboard Air Force One, following up on a Wednesday meeting with his national security team on how to proceed on the war, the White House said. Before his trip, critics questioned whether Obama should leave the country to make his pitch, given his already full plate. "Listen, I think it's a great idea to promote Chicago, but he's the president of the United States, not the mayor of Chicago," House Minority Leader John Boehner said, Politico reported. "And the problems we have here at home affect all Americans, and that's where his attention ought to be." Last month, when the Obamas hosted an event on the White House lawn to rally support for Chicago's bid, Obama was against making the trip. "I would make the case in Copenhagen personally, if I weren't so firmly committed to making -- making real the promise of quality, affordable health care for every American," the president said. But the administration had little choice but to raise the stakes, White House officials said, given that the other competitors all were sending their heads of state to Copenhagen. CNN senior political correspondent Candy Crowley said Obama's failure to bring the Games to Chicago won't cause any enduring political damage. "It opens him to criticism and it makes it difficult for him for a while. But will it mean NATO isn't going to send more troops to Afghanistan because he didn't get the Olympics? No. Does it mean that any Republican or Democrat will change their mind on health care? No. "He's going to be in a lot bigger trouble if he doesn't deliver on health care, believe me," she said.